FiftyFifty Brewing Co.: 2009 Imperial Eclipse Stout...release date set! As I thought about writing this a lot of moments in the past have come to the forefront of my brain. 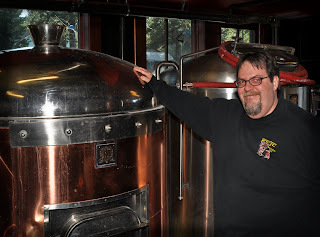 The first time I brewed Eclipse was when I was back at Flossmoor Station in Illinois. It was in 1997 fairly late in the year. We packed the mash tun full of malt well over a thousand pounds of it. Then there were the goodies we put in the kettle to drive up the gravity. Fun stuff. That beer would later be the first beer that had been aged in a Bourbon Barrel to be given a medal at the Great American Beer Festival and that was in 1998. When they still had the GABF at Currigan Hall. 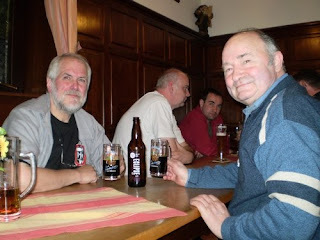 I remember after the awards ceremony that someone had dragged the Beer Hunter Michael Jackson over to taste the beer and have our picture taken together. Pretty neat stuff... We named that beer Imperial Eclipse Stout because on the day it was brewed there was an Eclipse of the moon. It's a name I wanted to keep using today and the folks at Flossmoor Station graciously retired from their lineup. Fast forward to 2009 and another milestone for Imperial Eclipse Stout will soon occur. 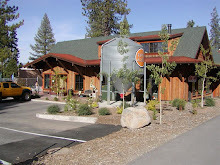 Since FiftyFifty opened in 2007 there have been two batches of Eclipse produced...small batches and most of the beer served over the bar. We hand bottled some but that is a daunting task to do even a few hundred bottles. The 2008 vintage got up to about 500 or so bottles and they got around...and by around I mean the entire country. If you look up on the beer rating websites you'll find reviews for Eclipse. Almost every single one a glowing review. Well, the 2009 vintage saw the greatest amount of Imperial Eclipse Stout brewed to date. We aged it in Elijah Craig, Heaven Hill Rye and Jack Daniels barrels. Rather than blend the entire lot we kept the barrels separate so the consumer could compare the barrel treatments if they desired. There is no better way to 'follow the journey of a barrel aged beer' than to taste the nuances left by the barrel itself. On December 23rd FiftyFifty Brewing Co. is proud to release the 2009 vintage of Imperial Eclipse Stout. The Elijah Craig and Heaven Hill Rye barrel aged versions will be available in wax dipped 22oz bottles. The Jack Daniels barrel aged version is anticipated to be available in the second week of January. At least two versions will be available on draught that day.